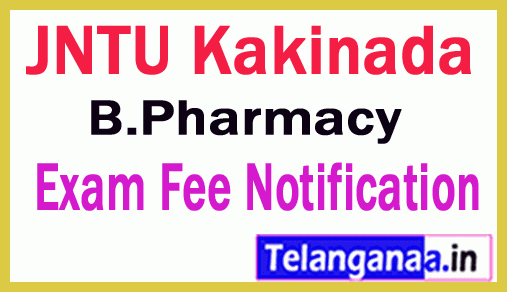 JNTU Kakinada B.Pharmacy 3rd/4th Year 2nd Sem Regular / Supply Exam Fee Notification 2019: Jawaharlal Nehru Technological University, Kakinada told B.pharmcy 3rd/4th Year 2nd sem examination fee notification on its official website at https://www.jntuk.edu.in/. All students are studied under UG and PG courses under the JNTU Kakinada . These candidates are applied to the JNTU Kakinada 1st Semester B.pharmacy courses they are looking for the ku B.pharmacy fee notification. JNTUK published the B.pharmacy Semester Contribution Dates Mar 2019. The JNTUK candidates can check their JNTUK B.Pharmacy under the link below. JNTU Kakinada has completed B.Pharmacy semester exam, which takes place in 2019. It is hereby notified that the B.Pharmacy 3rd/4th Year 2nd semesters (regular, supply) exams 2019. The following are the latest dates for paying the exam fees and processing the online application and submitting the manual application forms to the undersigned.